It’s been nearly a year since I was given carte blanche to travel again and boy have I taken advantage of it. In the last 12 months, I have visited countries from 5 different continents, visiting New York (North America), Dublin (my token Europe visit), Sydney and Melbourne (Australasia) and Bali and Malaysia (Asia). Adding South Africa to my bow, that makes 5. I was excited. Even when I was able to fly and jetting abroad at each possible opportunity, I had never made it as far as Africa. A whole new continent unexplored by my palate. Durban was my first stop on my World cup road trip and a great place to start my journey. With an interesting mix of cultures (including the largest Indian population in any city outside India) and a quite stunning stretch of beach, I happily spent the first four days of my trip taxiing around (as walking in city centres is ill advised in South Africa) discovering things on my own. As I was here for the football, I headed down to the beach where the fan park was located to start getting into the swing of things. With music blaring out before kick off to get the fans in the party mood, I headed down to the rather large food section to get my first fill. The stalls stretched out as far as the eye can see. 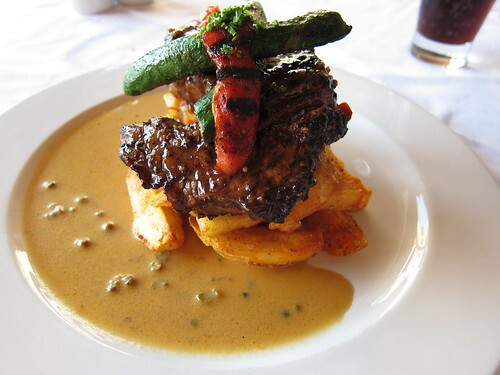 Comprising of predominantly Indian foods (with bunny chow’s, a half loaf filled with curry, and samoosa’s being particularly prevalent), I decided to opt for the other local favourite, the boerwors, a heavily spiced sausage which can be made from venison, pork, beef, mutton or a combination of the above. It’s not to everyone’s taste but smothered with the local condiments of neon yellow mustard (less sharp and more piquant) and ketchup goes down rather well with a local pint of Castle. 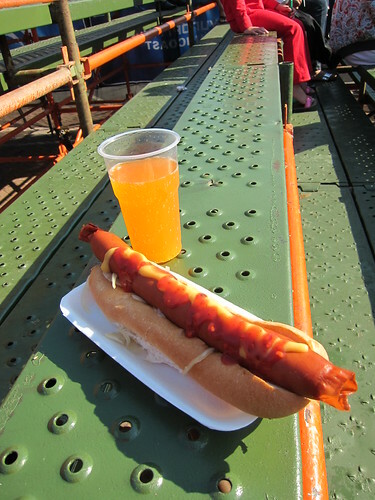 Alternatives include a kaasegriller, which is a hot dog made with cheese IN IT and of course the regular versions. Basically, a lot of sausages. Most of the places I saw to eat were predominantly restricted to outlets of popular local franchises such as Spur, Steers, Nandos and most commonly of all, Wimpy. I put the word out on Twitter and was sent to 9th Avenue bistro in the Morningside district of Durban. Located in a forecourt of a local shopping centre, I wasn’t expecting much. It appeared extremely simple from the outside and barring one other table enjoying their meal, I was the only other person eating. I needn’t have worried as all the food was actually very good. My starter of calamari was excellently fried. 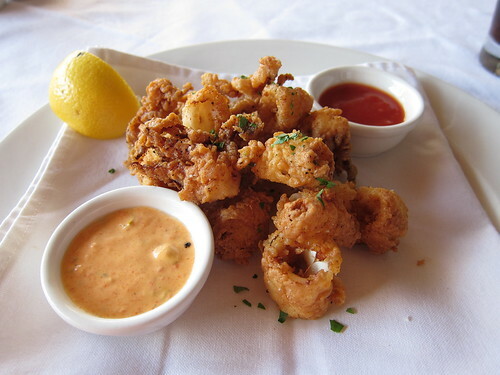 Greaseless and with a crisp batter, the squid was fresh and tender, with a perfectly balanced chilli aioli to accompany it. The steak came with a watery pepper sauce but was a pink medium hunk of meat sitting on a stack of crispy chips. Grilled with a sweet but peppery baste, I made my way through my meal, enjoying every bite until I could eat no more and called it a day. With a bill of just under £20, this felt expensive by Durban standards but you would struggle to find a meal as enjoyable in London for cheaper. After a few days completing tourist duties and generally sunning myself on the beach (even in winter, it can reach up to 30 degrees in the midday sun), my friends arrived, one of whom is an Indian Durbanite. Other than eating some excellent meals at his parents and family, including chilli bites made from pea flour and probably the best mutton curry I have ever eaten, we were taken to Sunrise Chip n Ranch, or Jonnies as it is known to the locals. 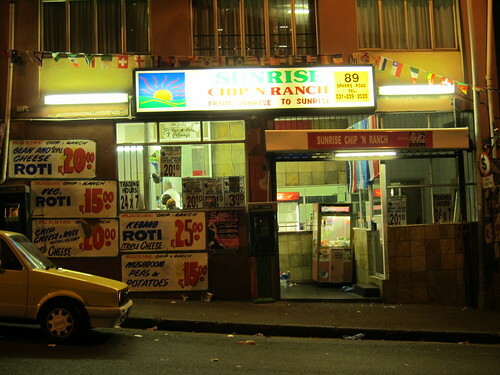 Selling a myriad of interesting local Durban delights 24 hours a day, it is renowned for its filled rotis and often has queues down the street waiting for theirs. Sent in blind, I wisely left my non Durban English partner in crime to order first. With no menu bar a few specials scrawled over the wall, I went for a base of chicken curry (the curries appear to be much drier and packed with spices, no coconut milk in sight) and triple cheese (nearly everything in South Africa appears to be served with cheese) and was shortly presented a wrapped roti as long as my arm. Carting it back to the car, I sat on the pavement and slowly peeled the wrapper away and took a big bite. All I can say is that the combination of slabs of cheese with curry is genius and the abnormally large roti was absolutely delicious. I ravenously tore into it but I was soon stuffed with a third of the roti still staring up at me. I looked up at my friend who was eating his off the car bonnet and he had admitted defeat at halfway. With a drink, mine came to around £4, an absolute steal. After all this uncultured gluttony, we opted to go for something a bit more civilised on one of our days away from football and headed to the botanical gardens. 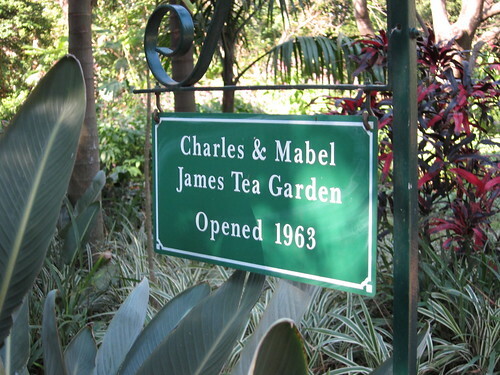 Whilst home to some stunning flora, it also houses Charles and Mabel James Tea house, a little tea hut run by elderly volunteers serving famous home baked scones and “crumpets”. The local versions vary quite significantly from its British counterparts. 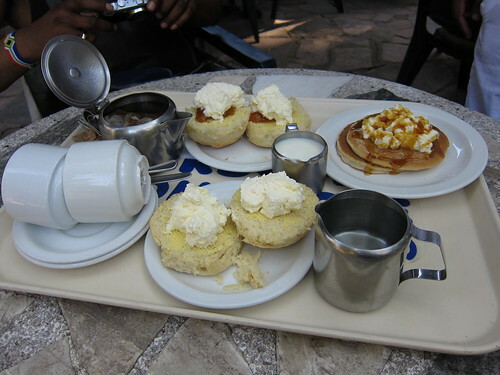 The scones are light and airy whilst the crumpets are more like small pancakes. All arrived smothered in home whipped cream and the scones were served with local preserve (apricot jam, I think) with the crumpets drizzled with maple syrup. A good place to see the local birds (as they try to scavenge any errant crumbs) and relax with a comforting mug of tea. 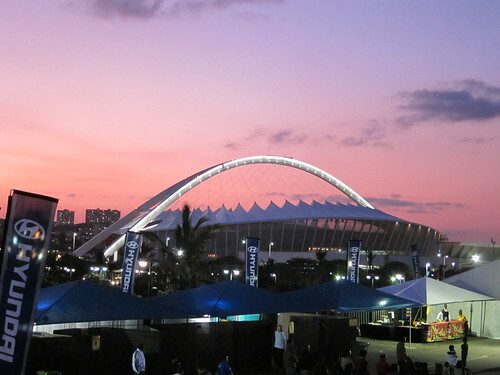 Durban had been an interesting place to visit and with three matches at the quite stunning Moses Mahbida stadium under our belt, it was time to hit the road and explore outside Durban. Next stop Port Elizabeth and then onwards to Cape Town. 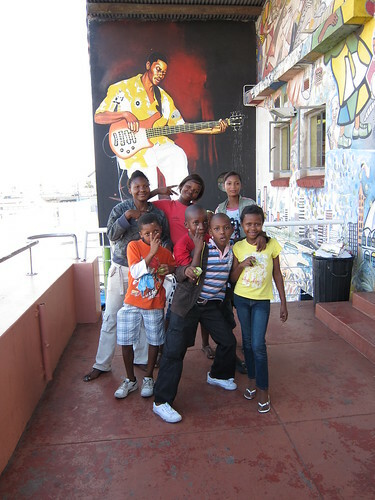 If you fancy taking a look at a few more Durban pictures, they can be found on my Flickr page. Loved the post! Sounded like a holiday from pretentious fussy food! 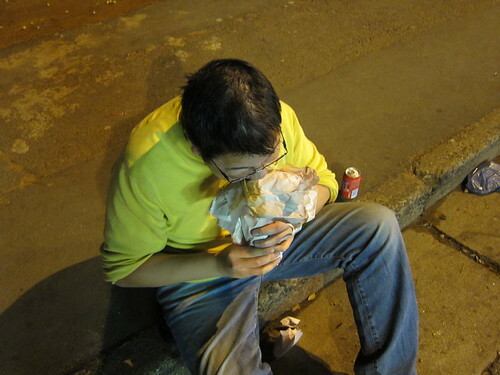 I like the gutter dining shot! You're all class!